At South Florida Institute for Wellness and Health in Aventura, Florida, Dr. Alan Ackermann uses various diagnostic tests to screen patients at risk for heart disease or those experiencing symptoms such as chest pain or shortness of breath; to detect very early signs of heart disease; or to diagnose urgent conditions such as a heart attack. Tests may be non-invasive such as a stress test, or invasive, such as cardiac catheterization. These heart tests help Dr. Ackermann assess your risk factors, diagnose your heart condition and recommend a treatment plan or lifestyle changes to help slow or prevent the progression of heart disease. For an appointment, call (305) 935-5101 today or request an appointment online. A cardiovascular examination includes visually inspecting the patient’s physical appearance for symptoms, checking pulse and blood pressure and listening to the heart, followed by laboratory blood testing. Specific blood tests can be performed to see if there is a problem with your heart or blood vessels, including cholesterol profile to measure levels of HDL (good cholesterol), LDL (bad cholesterol) and triglycerides; cardiac enzyme tests; blood clotting tests and more. Electrocardiogram (ECG or EKG) identifies if the heart is beating normally by measuring the heart's electrical activity. Learn more about electrocardiogram. Echocardiogram is a Doppler ultrasound of the heart to evaluate heart function. Echocardiogram is also referred to as transthoracic echocardiogram (TTE), Doppler ultrasound of the heart, or surface echo. Learn more about echocardiogram. Cardiac stress test evaluates how the heart works during exercise. It is also referred to as an exercise ECG, stress test, or treadmill test. Learn more about heart stress testing. Stress echocardiogram, also called a stress echo, combines an echocardiogram with a stress test to shows how the heart works during “stress,” or exercise. The echocardiogram uses sound waves to produce an image of the heart on a monitor before and during exercise. Stress echocardiography helps cardiologists diagnose coronary heart disease. A Holter or event monitor records the heart’s rhythm to help heart doctors diagnose cardiac arrhythmia. The device is worn for a period of time to record the heart's rhythm when you have symptoms. 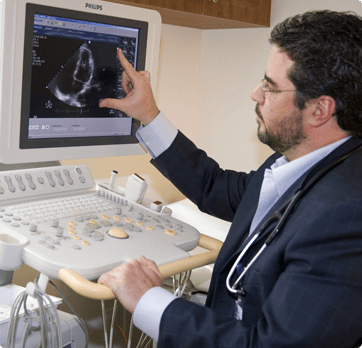 A Doppler ultrasound can measure the flow of blood within the heart, veins and arteries, as well as evaluate valve movement, helping to detect blockages. An arterial ultrasound can screen for stroke, peripheral artery disease of the legs, and aortic aneurysm - a common and potentially fatal disease. Venous ultrasound is useful for identifying clots (deep vein thrombosis), varicose veins, and chronic venous insufficiency. Screening for peripheral artery disease (PAD) includes a review of your medical history and risk factors for peripheral artery disease, blood tests, ankle-brachial blood pressure measurements, and Doppler ultrasound. Additional imaging tests, such as intravascular ultrasound or magnetic resonance angiography, may be recommended if necessary. Nuclear cardiology studies (stress testing and heart strength assessment) show images of how the heart pumps blood while it is beating. Nuclear cardiac imaging helps heart doctors diagnose coronary artery disease and predict the prognosis of people with heart failure. Doctors may take x-rays of your heart so they can see its outline to determine if your heart is an unusual shape or if it is larger than it should be. A CT (computed tomography) scan is a type of 3-D x-ray that is used to visualize any scarring and calcification of the heart. A contrast dye may be injected into the bloodstream to help doctors get a clearer picture. A cardiac MRI (magnetic resonance imaging) gives doctors a detailed picture of the heart, including the chambers and valves and helps them evaluate the function of the heart and its surrounding blood vessels. A specialized type of MRI, called magnetic resonance angiography, or MRA, produces images of the blood vessels leading to the brain, heart, kidneys and legs. This test allows your doctor to evaluate the blood flow through your arteries, as well as to detect brain aneurysms and vascular malformations. A contrast dye may be used to highlight the blood vessels and make the images even clearer. Cardiac catheterization provides information about heart function. During the procedure, the cardiologist advances a thin flexible tube through an artery into the heart. An imaging technique records pictures of the heart while it beats. Cardiac catheterization can help cardiologists diagnose heart defects, heart disease, heart enlargement, blood clots, coronary artery blockage, valve problems or aneurysm. Learn more about cardiac catheterization. Intravascular ultrasound combines cardiac catheterization with an echocardiogram to produce an image of the coronary arteries and to see their condition. This test is usually done in conjunction with an angioplasty. Angiography is an x-ray technique in which dye is injected into the chambers of your heart or the arteries that lead to your heart. The test enables doctors to measure the blood flow and blood pressure in the heart chambers, which can indicate blockages in the coronary arteries. It is often performed during a cardiac catheterization. If a blockage is identified by cardiac catheterization, the doctor may open the blocked artery or vein with angioplasty or a stent. During angioplasty, a small balloon-tipped catheter is guided into the blocked blood vessel. The balloon is inflated to open the vessel. Once the blood vessel is opened, the balloon is deflated and removed. A stent may also be inserted through the catheter. A stent is a tiny expandable coil that is placed in a blocked blood vessel to prevent it from becoming blocked again. The stent holds open the blood vessel to improve circulation and allow greater blood flow.